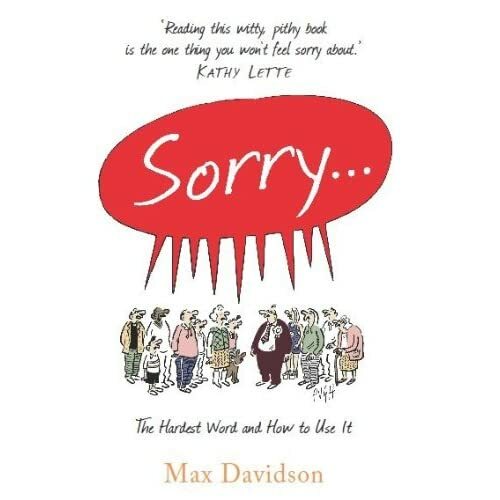 I’m currently reading “Sorry” by Max Davidson. I’ve absolutely no idea how this tome of wisdom arrived on my bookshelf. I have no recollection of buying it. I can only conclude that someone give/lent it to me. I am glad that they passed it on to me. Apparently “sorry” a very difficult, confused and confusing word. It’s a word that covers the entire spectrum of apologies. From the trivial “sorry I left coffee cup marks on the newspaper” through notable “sorry I inflated my expenses” to serious “Sorry, I’ve had a string of affairs and wrecked our marriage”. How can one word cover all of these? It doesn’t seem plausible that we haven’t evolved a variety of words to address the differing levels of apology but somehow we haven’t. “Sorry” just doesn’t cover the big stuff. The Vatican saying sorry for years of clerical abuse can never have a ring of authenticity. It couldn’t possibly express the level of regret and contrition needed to comfort victims of clerical abuse (not that I’m excusing the Vatican on grounds of technical linguistics, you understand). Not being able to help, or an expression of sympathy: “sorry, I don’t have time to go into this in detail”, or “sorry, can’t talk, in a rush” or “sorry your partner cheated on you”. Aologising on behalf of another: “sorry, the dog is usually so unfriendly”, or “sorry, junior is particularly cranky today”, “sorry, Mr Senior Mgr can’t see you now”. Not hearing what someone has said: “sorry, could you repeat that”. And, finally, down the list we reach the critical one, apologising for a wrong-doing: “sorry, I acted like a git”, “sorry, I shouldn’t have left that banana skin there”, “sorry I burned the dinner to a crisp and now there’s nothing to eat”. The word is so over-used and used for such a variety of things, one wonders if it has any meaning at all. Quite often, it can be easier to just say sorry. It stops a potential confrontation before it can build up steam. An example: “sorry for hogging the remote control, here you watch what you like”. It almost has an air of chivalry – if the remote hogger really is feeling guilty. A serious pet peeve of mine is the empty retailer apology. The “sorry we’re out of paper bags” or “sorry, we don’t have that in another colour” is usually so empty it makes me cringe. The retailer (ok, typically their assistant) couldn’t care less that they can’t meet your needs. By using the “S” word, they just rob the word of its meaning and trivialise it. On the other hand, there are cases where the “S” word should make a strong appearance but doesn’t. Senior managers, politicians and corrupt bankers spring to mind. It’s almost as if saying sorry is admitting guilt and they might be considered badly for it. The reality is that a weak boss who won’t apologise for being spineless or not supportive of her staff is held in less esteem than one who at least attempts an apology. The format of the apology is important. If the apology is insincere, the apologiser can look very ropey indeed. The big example here involves the word “May”. Example: “I apologise for any upset that my words may have caused” is often code-speak for “oh, all right then, if you’re so thin-skinned as to be upset by my words then I’d better throw an apology your way”. It leaves the recipient feeling more than somewhat indignant. Similarly, the apology followed by an excuse can be seen as a cop-out. “Sorry my expense claims as so huge but ……”. It doesn’t matter a jot what comes after the “but”. Its very existence negates the apology and suggests the apologiser isn’t really all that sorry at all. The apology has been diluted. There are interesting linguistic differences in how other languages express the meaning behind their equivalent of Sorry. The French have “je suis desole”/”I am desolate” which seems to carry more emotion than the English version. Chinese go even further with “dui bu yi”/”I can’t raise my face to meet yours”. On the other hand, Italian has “mi dispiace”/”it displeases me” which is hardly in keeping with the spirit of the word “sorry”. None of these can hold a candle to the Latin “mea cupla”, a straight-forward up-front no-messing-about hands-up admission of guilt. Unfortunately, much of our use of Sorry is far from straight-forward. Sometimes, it’s clouded in ambiguity. What exactly does the apologiser mean by their apology? An example: “sorry I lied” often means “sorry I was found out for lying” or it could mean” sorry I lied”. Another example is the “I owe you an apology”. How many times is the statement uttered and the receiver is standing there wondering if that is the apology or if one is forthcoming. That’s “Sorry” in a nutshell. As to the mysterious person who passed the book on to me, I can only say Sorry! Sorry for both forgetting who you are and not showing enough appreciation for your book when you gave it to me.